Location: Women’s Group Tea. Subgroup II. 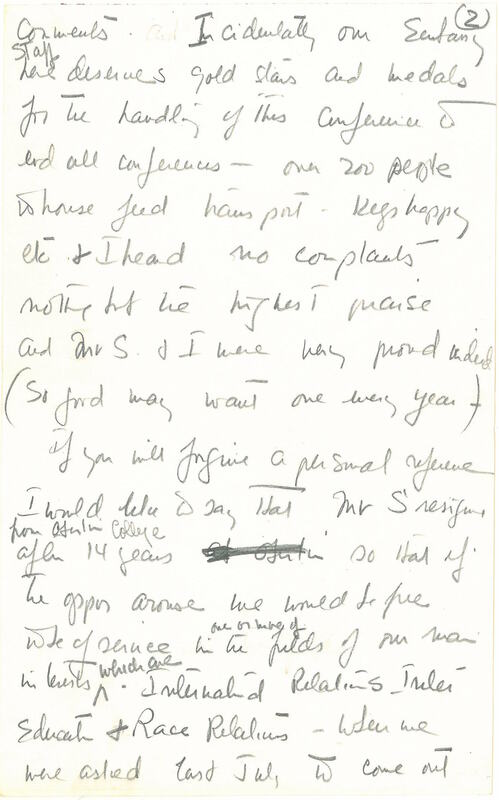 Eleanor B. Stevenson papers, Series 4. Honors and Miscellaneous Personal Papers, Box 1. 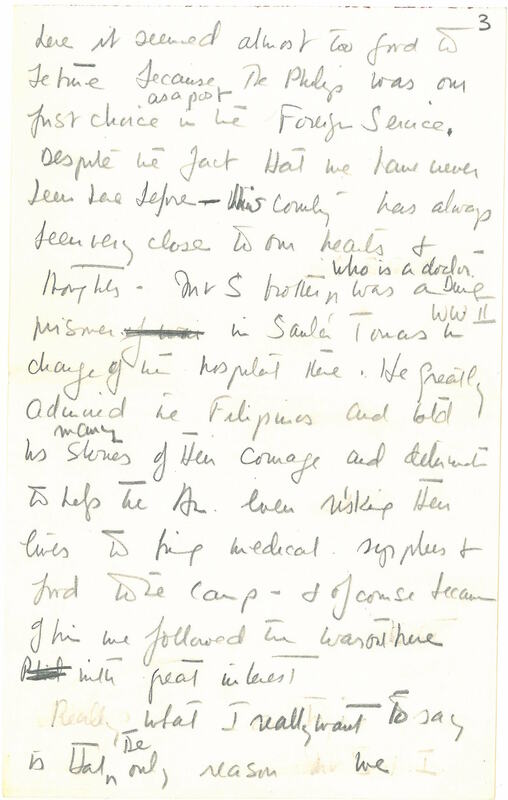 William and Eleanor Stevenson Papers, RG 30/219. O.C.A. In 1961, not long after leaving Oberlin, the Stevensons went to the Philippines, where Bill served as the U.S. Ambassador. Relations between the Philippines and the United States were particularly close, since the Philippines had just gained independence from the U.S. a few decades earlier. The relatively amicable and positive nature of U.S. rule in the Philippines, particularly compared with the previous Spanish colonization, meant that the U.S. and Philippines continued to have a positive relationship after independence, though Bill’s job was still a tricky one. As at Oberlin, his partnership with Eleanor allowed the two to accomplish much more than would have been possible for him alone. As always, during her time in Philippines, Eleanor worked hard giving lectures, providing hospitality, and trying to improve the world. 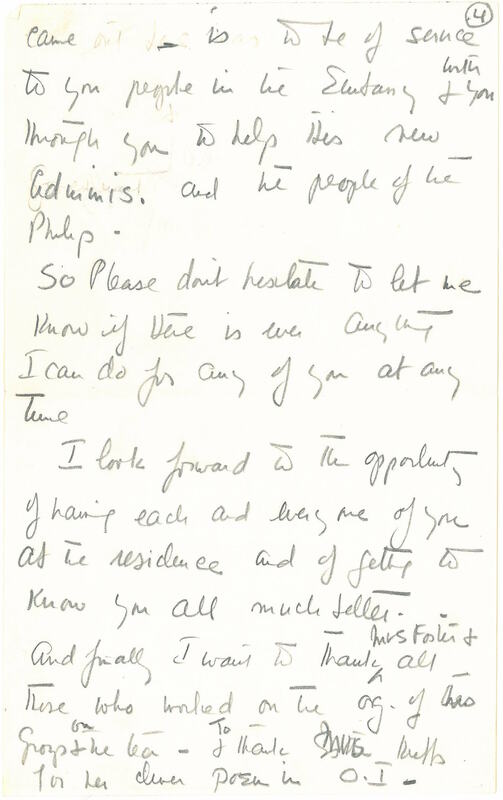 The following document appears to have been written for a speech that Eleanor gave at a tea held by a Women’s Group during her time in the Philippines. 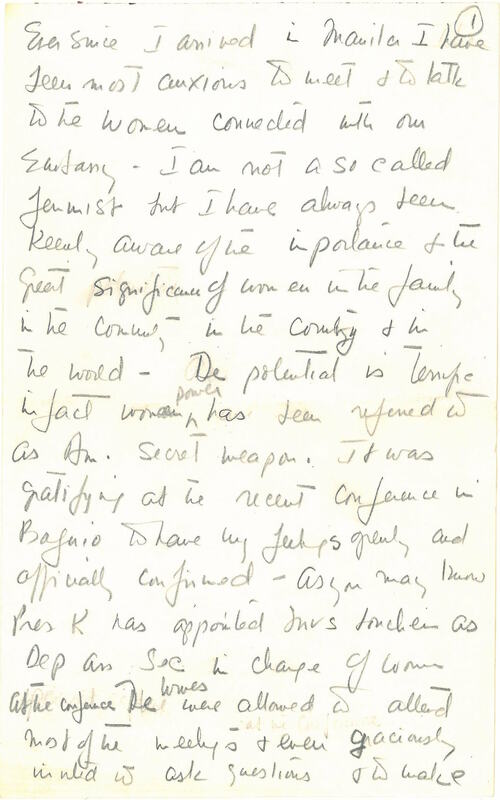 As it is written in pencil, extensively marked up, and lacking proper punctuation, it was most likely a rough draft. This speech is of particular interest as she most likely wrote it for a solely female audience. In it, she prefaces her brief discussion of “woman power” by rejecting the “Feminist” label. She delicately weaves together the personal and the political in this speech by explaining her and her husband’s reasons for coming to the Philippines. She cites her husband’s resignation from Oberlin as well as their mutual interest in international relations, international education, and race relations. Stevenson’s closing remarks here exemplify her warm and empathetic leadership. “Philippines – The Period of U.S. Influence | History – Geography | Britannica.com.” Accessed 11 July 2016. Source. While the source of this quote is unclear, it was commonly used (“Partners in Winning the War: American Women in World War II.” National Women’s History Museum. Accessed 5 July 2016. Source). This appears to have been a Regional Operations Conference for U.S. Ambassadors and their advisors in East and Southeast Asia, held in Baguio, Philippines from March 12-14 in 1962. The conference was headed by Chester Bowles, U.S. Ambassador at large, but as the Ambassadors in the Philippines and thus the de facto hosts of the conference, undoubtedly the Stevensons were very much involved in the organization and logistics of the event. Though the conference was specifically for the Ambassadors, their wives also attended, a fact which gratified Bowles. He said “the attendance of the ambassadors’ wives was an important innovation. As every Foreign Service officer knows, a wife sensitive to local problems, aware of our government’s interests and objectives and eager and able to help can be a tower of strength in any overseas mission, large or small. For better or worse, it is the ambassador’s wife who sits beside the highest officials of foreign governments at dinners and formal functions. Thus, to broaden their knowledge and understanding of our objectives and operations, the wives attended all but the most highly classified discussions.” Presumably Bowles made a similar statement about the importance of ambassadors’ wives at the conference itself, which is what Stevenson is so pleased about here (Lee H. Burke, Ambassador at Large: Diplomat Extraordinary. (The Hague: Martinus Nijhoff, 1972), 89-90. Source). Katie Louchhim (1903-1991) was born Kathleen Scofield. She was heavily involved in U.S. politics after her husband was brought to Washington in 1934 to organize the Security and Exchange Commission for the New Deal. She served as the Vice-Chairwoman of the Democratic National Committee from 1956 to 1960, as well as serving in the Office of Foreign Relief and Rehabilitation, and both helped establish and serve in the United Nations Relief and Rehabilitation Administration. 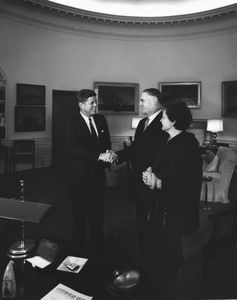 She was given a post in the State department by John F. Kennedy, and within two years was named the Deputy Assistant Secretary for Public Affairs, which at the time was the highest position ever held by a woman within the department. She also held other posts within the State Department, and became a United States Ambassador to the United Nations Economic, Scientific and Cultural Organization. Apart from her political work, she was also an accomplished poet (Glenn Fowler, “Katie Louchheim Is Dead at 87; Official for U.S. and Democrats.” The New York Times, 12 February 1991, sec. Obituaries. Source). “Inter” is possibly short for international in this context. “Philip” is an abbreviation for the Philippines. This is probably Theodore Dwight Stevenson (1903-1999), whom the 1940 U.S. Census listed as a doctor. From the same census, it seems he had also lived in Canton, China (where his wife was born) in the 1930s. He was married to a Beatrice Stevenson (b.circa 1911) and they had two sons: Donald, then age four, and David, age 2 (“Theodore Dwight Stevenson – Facts.” Ancestry.com. Accessed 5 July 2016. Source). The Santo Tomas Internment Camp, also called the Manila Internment Camp, was located at the University of Santo Tomas in Manila, Philippines. The camp was established in January of 1942, after Japanese forces took Manila. American civilians living in the Philippines, as well as American POWs and many members of the American Red Cross, were interned there until 1945. Conditions in the camp varied over the course of the war, from being relatively comfortable to severely overcrowded for the civilians, and from horrendous to sometimes fatal for the the captured soldiers (Frederic Harper Stevens, Santo Tomas Internment Camp. (New York: Stratford House Inc., 1946), Source). Many accounts of internment camps in the Philippines speak of the aid offered to imprisoned U.S. soldier by sympathetic Filipinos, who also often carried information between the camps. A number of men credit their survival within the camps to that aid (Doris Weatherford, American Women and World War II. History of Women in America. (New York: Facts on File, 1990), 5-7). Probably referring to the Kennedy Administration. This person could not be identified, she is presumably one of the women within this group. This person could not be identified. This publication could not be identified.